Depart lodge at 7.00 am for Poring Hot Spring, (takes 3hrs road journey) driving pass remote villages with great scenery of the valleys. Upon arrival, take a quick dip in the hot spring pool which most people believed to possess medicinal effect. 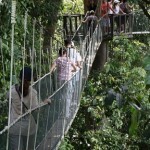 Option to trek to the Poring Canopy Walkway to experience life & sight from above tree tops. 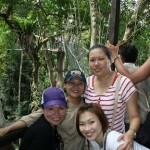 After that, depart for Kinabalu National Park. Upon arrival at the Park, lunch at restaurant. After lunch, one can opt to do the many trails or just relax & enjoy the cool weather at the Park. 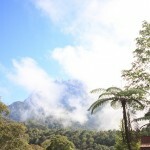 There are over 1000 species of flowers and plants found at Kinabalu Park. Visit the mountain garden or do some nature walks. Relax until time to depart for Kota Kinabalu in the afternoon and back to the lodge. Things to wear/bring: Extra clothing, personal toiletries, suitable trekking shoes, water and sun block.